Who Says a Tattoo is Forever? With advanced Laser technology, we can remove your tattoo or help you redo/repair your tattoo. No matter the tattoo size, tattoo ink, tattoo color, or skin type, we have the solution for you. Ask about our Pain Free Option. What is Your Tattoo Type? Professional Tattoo – This is the most common tattoo type. Applied by professional tattoo artists and have a high density of ink. Laser tattoo removal of professionally applied tattoos usually requires the greatest number of treatment sessions. Lighter ink colors are more difficult to remove than darker inks, while white and peach colors may prove impossible. Cosmetic Tattoo / Makeup Tattoo – Tattoos applied to the lips or eyebrows can create the illusion of permanent makeup. Compared to professionally applied tattoos, these tattoos have less ink and usually require fewer treatments. “Organic ink” may have been used in these tattoos and it can change colors when treated with a laser. Amateur – Amateur “stick and poke” tattoos are applied with a needle that has been dipped into some sort of ink and then inserted into the skin. Generally, these tattoos are more superficial in the skin and contain less ink than a professionally applied tattoo. Removal of this type of tattoo usually requires fewer laser treatments than professionally applied tattoos. *Medical Tattoo – These tattoos are usually applied by healthcare professionals to aid in radiation therapy. They usually contain less ink and take only a few laser treatments to remove. 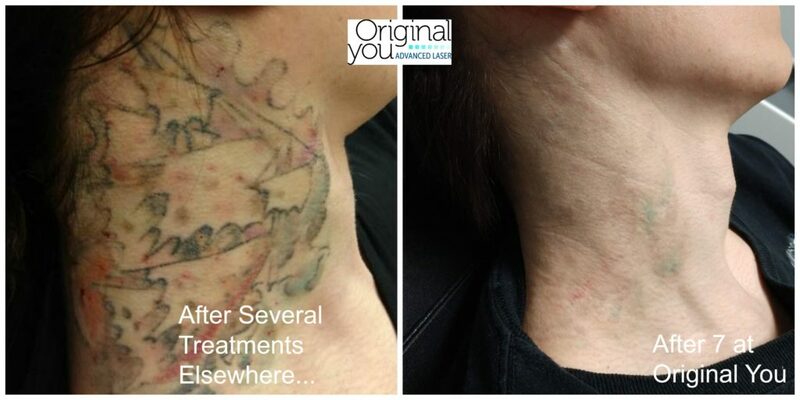 *With a written referral from your Oncologist, Original You will treat Radiation Therapy Markers or Tattoos for free. Traumatic Tattoo – Physical trauma can leave debris and particles embedded in the skin. In some cases, laser treatments can remove these particles. Schedule a consultation to learn more about what can be done. A tattoo is created when ink or another type of pigment is injected into the skin. Once the ink gets into the skin, your immune system attacks it and surrounds it forming large globules. 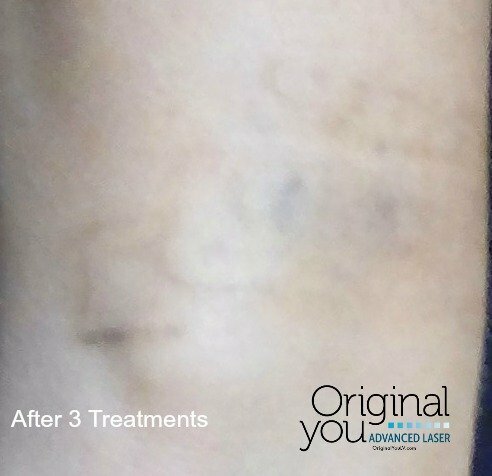 The laser works by hitting the globules and breaking them into smaller pieces which allows the ink to be absorbed and cleared through the lymphatic system. Not all lasers are equal. Q-switch lasers were the original work horses for tattoo removal. 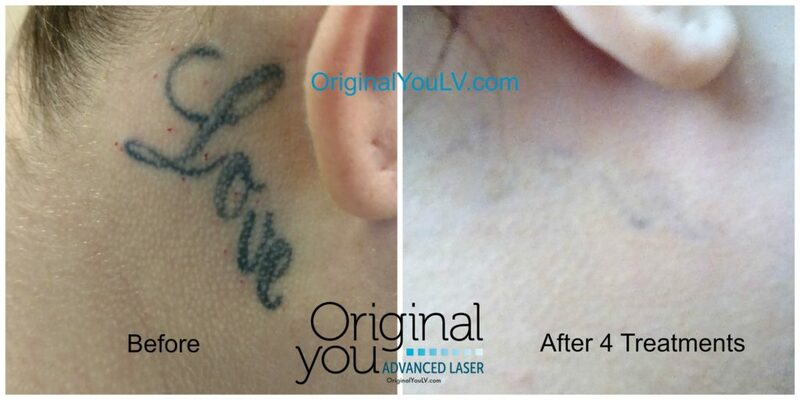 In recent years, a newer type of laser has been developed that is significantly better for tattoo removal. The picosecond or pico laser. These lasers generate a more powerful strike on the ink globules pulverizing them into smaller particles than Q-switch lasers. This allows for more rapid absorption and faster removal of your tattoo. The Enlighten III from Cutera is one of the newest and best lasers for tattoo removal. 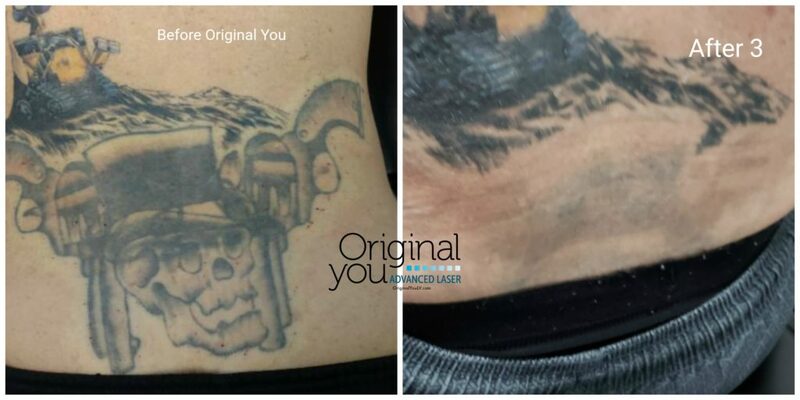 Original You was the first practice in Nevada and currently the only tattoo removal clinic in Las Vegas to offer this incredible advanced technology. A third-generation picosecond laser with dual wavelengths and dual pulse durations enabling the Enlighten to treat all types and colors of ink – in half the time of a Q-switched laser! Allows the Enlighten to remove all colors of ink, (including blacks, reds, blues, greens, yellows) with one laser. This allows for faster removal than previous lasers. The laser shatters ink particles in the skin. Multiple pulse speeds allow for more precise treatment, lowering the chance of side effects or collateral damage. 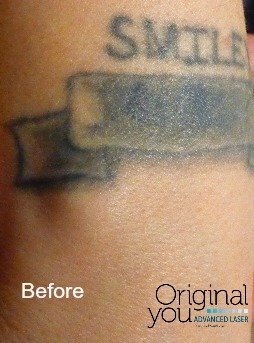 Allows the Enlighten to remove small to large tattoos in a similar amount of time. With the power of the Enlighten laser, we’re able to remove tattoos faster than any other laser allows. Why spend extra time with unwanted ink if you don’t have to? Video of a third treatment on a tattoo, only removing part of the tattoo. Want Your Tattoo Removed Even Fast? The DeScribe® PFD Patch – an FDA cleared patch made of dual-layered silicon infused with PFD. The patch, which is placed over the tattoo during treatment with the laser, decreases scattering of the laser light, allows for several passes of the laser at a single treatment session, and draws heat away from the skin. The result is fewer treatment sessions with improved comfort! Unlike the R20 method used previously to allow multiple passes of the laser in one day, there’s no waiting between passes with the DeScribe® PFD Patch and therefore adds little to no time onto the laser tattoo removal treatment session. Just another innovation available to you at Original You to help you Reclaim Your Past in less time. You can read more detail on the PFD Patch in our article here. Don’t spend another day with that unwanted tattoo! 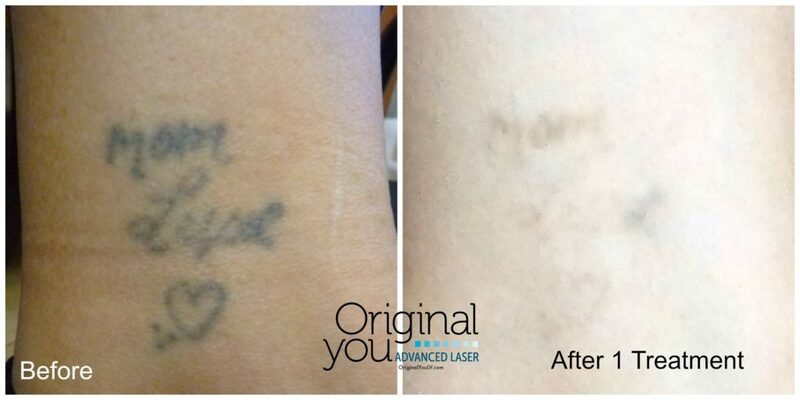 Schedule a Free Consultation today to see if Laser Tattoo Removal is the right option for you! When the laser is used on your skin it generates heat. This is a necessary byproduct of the interaction between the laser light and ink particles. This heat causes pain and tissue injury to your skin. Ask about our Pain Free Option. After treatment, you will have the equivalent of a sunburn and blistering and swelling may occur. The tattoo will usually turn a “frost” white color immediately after treatment and then return to its pre-treated color within 24 hours. Then the tattoo will begin to fade. Treatments are spaced at least 6 weeks apart. This is done so that the skin can completely heal in-between treatments. It’s perfectly ok to have your treatments spaced out more than 6 weeks if you prefer. At Original You we want to make sure that you are aware of the potential cost of removing your tattoo and the factors involved in determining that cost. Every tattoo is different and so is every patient. Pricing is determined by the size of the tattoo, ink color, amount of ink, depth of ink, and amount of color present. All quoted prices are for individual treatments with an option for package pricing. We will provide you with an educated estimate to the number of treatments our physicians believe it will take to remove or fade your tattoo. Individual/Pay-As-You-Go Pricing: For those that want to pay a set price each time they visit us for treatment. NO Interest/NO Credit Check Payment Plan: Original You offers an easy, no credit check, no interest, no fee in-house payment plan. Original You also offers financing through LendingUSA (even with the interest, for most people this still saves you money for the package pricing and there’s no early pay-off penalty). We also accept CareCredit. Read More on our Financing Page. 10 Treatment Guarantee: And at Original You we believe in our technology, skill, and experience: we will not charge you beyond 10 treatments. If you feel you need more than 10 treatments we will continue to treat your tattoo for up to 1 (one) year from your 10th treatment. To the people reading this that are on their 15th or 20th treatment somewhere else…yeah, this has been our policy since day 1, sorry you didn’t find us sooner. Yup, our price per treatment might be higher than that place that you went to for your past 15 treatments and you can still see your tattoo….We’re here, whenever you want to come see us, no judgement. We don’t price match, we’ve invested in our technology and the skill of only having healthcare providers performing our laser tattoo removal treatments. Including the Chief of Surgery at Mountain View Hospital. 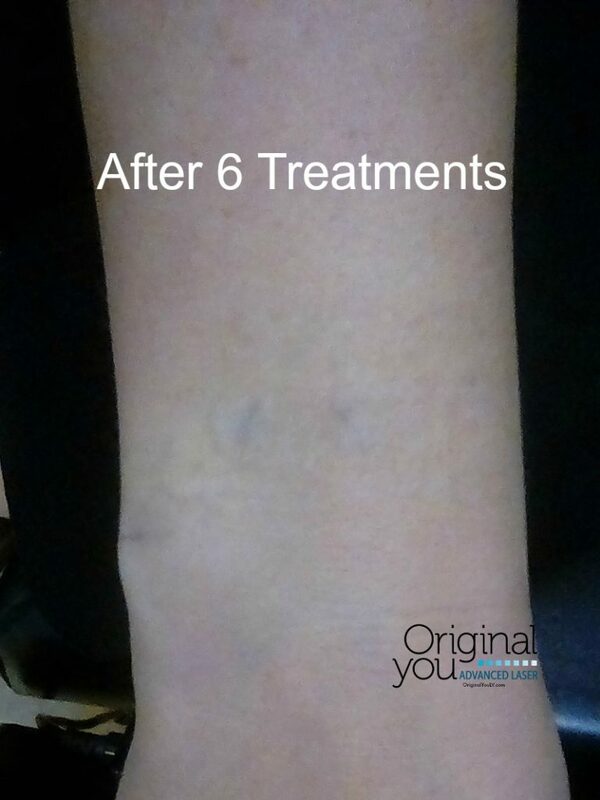 Who you can’t have your laser tattoo removal treatment with at Original You? A: a non-healthcare laser technician. We only have appropriately trained healthcare professionals performing laser tattoo removal. At Original You we are dedicated to building a lasting relationship with our patients. As the Professional Choice for Laser Tattoo Removal in Las Vegas, we will work with you as best as possible to help your treatment succeed! Come in today for a free consultation to find out how Original You can help you Reclaim Your Past. Additional before and after pictures are shared on Original You’s Instagram and Facebook accounts.